Avocados are such a versatile fruit. You can use them in salads, soups and sandwiches. You can use them as serving vessels. You can make salsa and everybody loves guacamole. Did you know that unlike most fruits, an avocado doesn’t have to be picked at any certain peak time but can remain on the tree for a while. You see, avocados ripen only after they are picked. This allows the fruit to be harvested year round and it ships well. The problem with this process is that when you go to the store and buy avocados many times the avocados simply aren’t ripe. Unripened avocados have a slight unpleasant astringency and bitterness to them and are hard, fibrous, little green ovals. So, what in the world do you do with an unripened avocado? You grill it, that’s what. I know some of you are saying “You do what?” Really, you grill it. 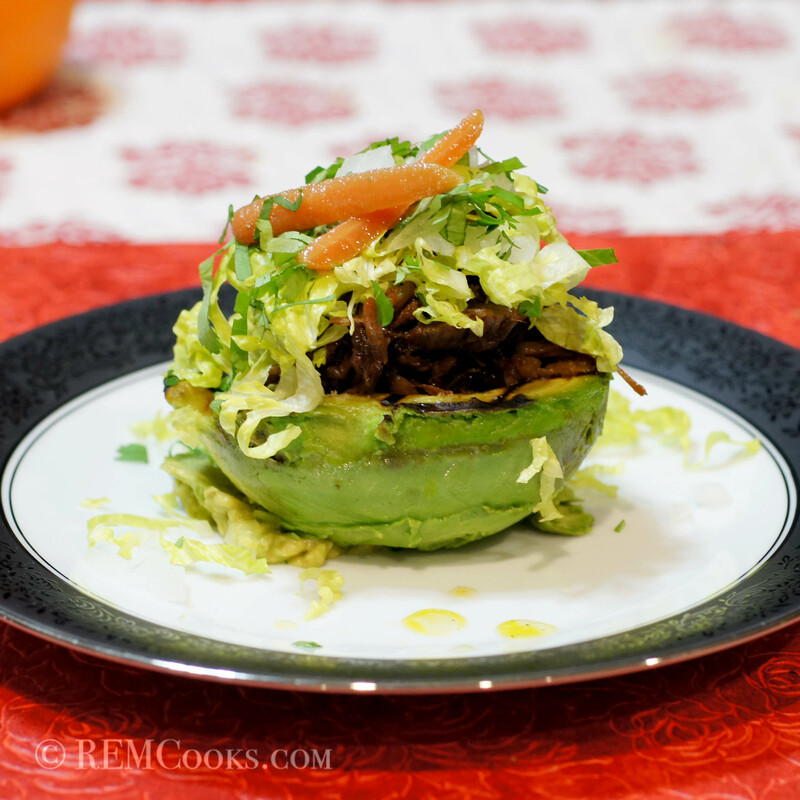 Grilling unripened avocados helps to soften the flesh and adds just a touch of smokiness to the dish. A little salt helps take away the bitterness. Now, if the avocados are extremely unripe, i.e. rock hard, don’t buy them if you are going to use them immediately. There is nothing you can do with an extremely unripe avocado except be patient. If you messed up and bought it anyway, take the time to allow it to ripen. Grilling an extremely unripe avocado will result in a bitter grilled avocado and you will say grilling doesn’t work. It does work, just not on extremely unripe avocados. I have been wanting to grill some avocados for a while. So, this was my opportunity to do so. We had some leftover 6 chile braised pork and weren’t really in the mood to cook inasmuch we had cooked so much for Christmas. We also weren’t in the mood for a huge meal. This was a nice appetizer before dinner but would make a beautiful light lunch. Give it a try. You will like it. Brush the avocado halves with a little olive oil and sprinkle with sea salt. Place avocado halves on a very hot grill. Cook roughly 2 minutes and rotate to form nice grill marks. Cook another 1 – 2 minutes. When done, remove from heat. Using a spoon, loosen the fruit from the skin. Place fruit on a plate and fill with red chile braised pork. Sprinkle with shredded lettuce, diced onions and chopped cilantro. Finish with jalapeños en escabeche, serve & enjoy. NOTES: If you choose and want a little extra brightness and heat, you can garnish this with canned, pickled jalapeños, or you can use Jalapeños en escabeche. I love an avocado that has been cooked. Never thought of grilling the not so ready ones. Will give this a try. Hi, Dennis. It’s good to see you out and about again. Let me know what you think about grilling the not so ripe ones. We thought it was pretty nifty and we love the little smokiness grilling lends to them. We’ve been looking for some unique uses for avocado, and this fits the bill beautifully. I would have never thought to grill and stuff them! Thanks, Sarah. We hope you give this a try. It’s a little unique and a fun way to use them. Although I enjoy them, I know little about avocados. This post, Richard, will be big help with the next ones I buy. And I really must try grilling one. I’d no idea that they’d stand up to the heat and be enhanced by it. Thanks for writing such an informative post and delicious recipe. John, you are always very kind. Thanks for the nice words. Grilling avocados is a different way to fix them and we like the smokey quality grilling gives them. It’s also a neat trick for the ones not quite ripe. Inasmuch as avocados go with Mexican food, we figured we would stuff them with the leftover taco meat. It was great! Wonderful idea, grilling the less-than-ripe avocadoes! Actually, I’ve yet to try grilling avocado to begin with — I can see this leading off towards the horizon of some really good meals. Thanks. That sounds delish, Richard! Happy New Year! Thanks, Allison. 🙂 We’re glad you liked it. We also hope you have a very Happy, Healthy and Prosperous New Year! Very nice looking dish Richard. Avocado here in Ireland is nearly always slightly luminous and rock hard. One needs to plan about two weeks in advance of a meal when buying. Happy New Year to you and Baby Lady. Wow!!! Beautiful!!! Love it! I LOVE avocado and this looks amazing! Happy New Year! I always thought that the avocado would get mushy so you’ve answered my question about what avocado to use. The store always has unripe ones so this looks wonderful. Hi Richard, Happy New Year and the foods looking delicious as always! Love the idea of roasted those scorch marks into the avocado and with that beautiful pulled chilli pork I’m sure it’s the best remedy after Christmas seasonal eating. Here’s to 2013 and many more noms! Hi Alice. Thanks for the nice compliment and Happy New Year to you, too. 😀 Hope you had a fabulous New Years Eve. I’m looking forward to seeing some of your new creations in 2013. As a kid I liked avocados with sugar, my mom ate them with either lime or shoyu. Your stuffed avocado looks and sounds delicious! Hi, Jennifer. Thanks for the nice compliment. Until I ate avocado ice cream, I would have thought avocados and sugar were a terrible pairing. After eating avocado ice cream, I discovered sweet and avocados actually go together. I still prefer mine on the savory side but there are some really neat avocado desserts that I just love. Thank you, Virginia, for such an honor. That was very sweet of you. I’ve never had cooked avocado. I’d have worried it melts! This looks like a great appetizer for the summer. Thanks, Stefan. Avocados are so creamy you would think they would melt if cooked. We hope you give this a try. It really is a fun appetizer and people will be surprised that you cooked the avocado. You always make me hungry for Tex-Mex food when I stop by for a visit. Oh to be a guest in your kitchen for some of your delicious cooking. Karen, you are welcome in our house any time. Let us know when you’re coming or you might get Italian food instead of Tex-Mex, Southwestern or Mexican food. 😮 Pretty soon I’m fixing Tortilla Soup. 🙂 We’ve had some really great meals of late but the photos were a disaster so they will need to be redone later. 😦 I do wish my photos were as good as yours.